The following are letters received from pastors, bishops and ministers from all over the world expressing, in their own words, their support and love for the ministry of John Polce. John Polce is unique among Christian artists. He is so unique he is hard to define, for his ministry and gifting transcend most of the Christian labels. He is more than a performer. He is not a traditional worship leader, though he can certainly lead worship. His "concerts" are more than concerts. If there is one way that I can define what John does, it is that through music and ministry of the Word, he leads people into the presence of God. Having participated many times in John's "concerts," I can only describe each one as a transcendent experience. Each has been an encounter with the Holy One of God - a revelation of the Cross of Christ that can only be produced by the Person and power of the Holy Spirit. Perhaps this is why I have been listening to Jon's music for twenty years with a freshness that never fades. There is an enduring quality about John's music for it touches the Eternal and flows out of a minstrel who knows that he is simply a vessel. Like John the Baptist, John Polce is a man who has learned to "decrease" that Christ may "increase." More than new programs, the church today needs an "increase" in the presence of God. Our people are hungry for God. They are thirsty for the "living water" of the Spirit. They are desperate for an encounter with the holiness of God. May the Lord raise up more servants like John Polce in our day whose gift to the Church is not another program but His Presence! 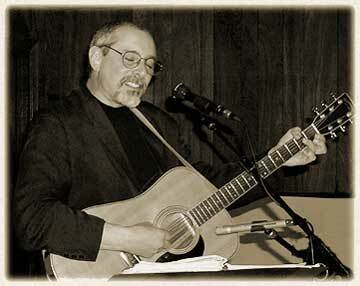 John Polce is a very gifted singer and guitarist who underwent a deep conversion about twenty years ago and since then has devoted his life to sharing his faith with all who will listen. He does this most effectively through his own most sincere personal witness and the beautiful songs based on the Scriptures which he has composed and sings so well. His work has been mainly on the Eastern seaboard of the United States but some two years ago he paid a visit to one of our parishes and they were greatly impressed with his evangelical work and looked forward to his coming back again. Last year the possibility arose that he would be able to spend an extended period in this country and I was delighted to have the opportunity to invite him to come to the diocese of Hexham and Newcastle and extend his work, not only throughout the diocese, but more widely across the country wherever he might be invited. It is always important to win people to faith in Jesus Christ and perhaps particularly at the present time and to this he makes a major contribution. We are delighted to have him living and working in the diocese and we have been much encouraged by the support that he has already received. John Polce has just finished offering a retreat at our Center. The evaluations received as well as word of mouth comments from the participants attest to the spiritual success of the weekend. John's approach to the retreat ministry as well as his retreat content is uniquely his own and well appreciated by the retreatants. I would not hesitate to recommend John as a retreat leader if your Center or Retreat House requests his services. Thank you for the wonderful Parish Mission you gave to St. Anne's on October 28, 29, and 30th. Your theme, "The Abiding Love of Christ", was most appropriate and your presentation in song and verse certainly filled those who heard you with a most effective presence of Jesus in their lives. Your ministry is to be commended and your inspirational songs are really Spirit-filled. I hope the good Lord continues to bless you and inspire you, using you as His instrument to bring His love into our world and build His kingdom in the hearts of all. I wish more of our priests knew about your ministry. I surely do put my stamp of approval on it and will spread the "Good News" by word of mouth. Enclosed please find the Directory for the Diocese of Syracuse to use for address purposes and tell all that Father Prevost highly recommends this new style of Mission of Song, Scripture, and Verse, especially as it comes from a heart filled with God's love! God bless you, John, and keep up the good work! May the love of God our Father be with you today and always. I again want to commend you for the inspiring music and ministry you brought to the National Catholic Charismatic Renewal Conference at the University of Notre Dame in 1998. You are a gifted man of God and it is a blessing to see you using your gifts to build up the Body of Christ. I want to highly recommend your ministry to all with whom you may be in contact. I would be happy to speak to anyone who may have questions about your ministry. May the Lord, through the Holy Spirit, continue to empower you in all that you do to proclaim Jesus is Lord. John Polce is a talented and gifted composer, vocalist and guitarist who changed his tune long ago when he deserted the eminent glitter and fame of popular music for a new and very special ministry. The good news is John Polce now performs for the Lord in a ministry of music that raises worship and reconciliation to new heights. John is not only a good musician, he is a good man, a special man, a spiritual man, who heard the Lord say "Follow Me," and then answered. He has placed all his energies and talents in the hands of the Lord, and we are so much the richer for it. John brings the Holy Spirit to us in evenings of song, concerts, parish missions, conferences, retreats and healing services. I am more than comfortable, confident and delighted to recommend his powerful, prayerful presentations to all those open to a wonderfully healing, enriching, spiritual experience. I write this letter to pastors and others in our diocese who might benefit from the talent and music ministry of John Polce. I have known John for many years. I have been inspired by his personal faith, and his desire to share that faith and the gifts God has given him with others. He has been very successful in reaching out to young people in the past. His work now is directed to adults, and actually to people of all ages. He gives moving musical presentations of his own compositions, as well as the work done by other contemporaiy artists. I find it very easy to give this letter of recommendation for John Polce. I am convinced that the Lord is using him as an instrument for evangelization. People who know him have that same judgment about him. I am happy to recommend that opportunities be provided for him to reach out to people with his artistic method of bringing God's message and life to our people. This letter comes late but with no less enthusiasm over the wonderful and faith-filled retreat experienced by the people of St. Maria Goretti Parish. Your approach, combining music and scripture, I know really anointed me and strengthened my soul while I was ministering to my dying mother. No less so did those who attended your retreat find the prayer and the ministrations of those three days an absolute divine embrace. What a blessing! Your idea to set aside the celebration of the Eucharist for those nights and instead celebrate reconciliation, anointing and blessing allowed all of us with such a "fasting" to re-appreciate the Eucharist and its depth. I would welcome you back anytime - especially since we are in our 50th jubilee year as a parish - and recommend you to any pastor and parish who are open to a different kind of retreat experience that does not "clutter the mind" but definitely "refreshes the soul". Thank you, John, and thank you for your patience. The peace of the Lord be with you and yours, always! We invited John Polce to come and live and work in the diocese of Hexham and Newcastle in England about twenty months ago. He quickly adapted to the very different English scene and has given many beautiful presentations in music and song. Everywhere he has been warmly welcomed and greatly appreciated, which speaks very highly of him when you understand that this is a relatively conservative part of the country and people are suspicious of anything new. It is not only the beauty of his music but above all his great sincerity and deep faith which speaks profoundly to people. It is not possible to evaluate the full effect of a mission such as his but undoubtedly a number of people have been so touched as to change their lives and only God will know the full good that he has done. We are sorry to say goodbye to him but it was always planned that he should return quite rightly to his native land where I am sure he will continue to do great good. I first met John Polce at a Notre Dame Conference this June. He caught my attention as be discovered me having difficulty with my luggage and he offered to help. I later discovered that he had a unique talent with music and was fascinated to note bis ability to lead music for 3,000 people for over two hours. He exuded a special peace with contrasang praise. I had heard that it would be a different approach to healing through music and found that true for myself. John has a gift for incorporating significant scripture passages with music that includes the crowds and music that carries a peaceful happy mood that I would be inclined to associate with St Francis. John is a beautiful singer when he sings solo but delights more in engaging the people. Most people find him a unique blessing. 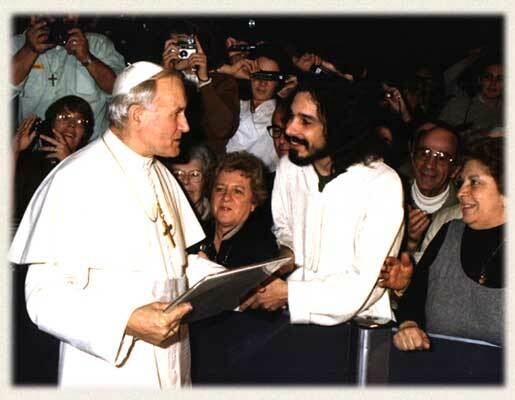 In 1982, on a trip to Rome, John Polce and a group of pilgrims went to see His Holiness Pope John Paul II. A fellow traveler gave up her seat so that John could personally meet the Pontiff and present several of his records to him .